Winters may knock here any day and the need of a moisturizer becomes the utmost importance of all. In the Complete Guide To Natural Skin and Hair Care, I declared that not only I prefer using natural, home made products, I actually USE them! Last winters I used a DIY moisturizing body butter that worked for more than 24 hours and kept my skin soft and smooth throughout. This winters I will make a fresh batch again. Along with the DIY body butter, I also use a DIY body lotion that is a staple in my beauty regime. I simply can’t do a day without it. This body lotion requires only three ingredients to prepare and it is used for multiple purposes. This body lotion is one such product that serves many uses and can be used as a face moisturizer, lip moisturizer (or a lip balm), a body lotion to smoothen rough areas like elbows, knees, as a deodorant on the arm pits, as a lotion to lighten dark spots on the body or as a simple body lotion. I have been using it for as long as I can remember. At least for the last 10-15 years I clearly remember having a bottle of it ready at home. So when I can tell you it is a miracle product, you can trust me because I have tested it, tried it and used it. The main thing in the making of this body lotion lies in the consistency and it depends on what consistency you prefer. I prefer more of glycerin in winters while more of lemon and rosewater in summers for the obvious reasons of glycerin’s moisturizing properties and lemon’s anti bacterial and bleaching qualities. You can alter the quantities as per your preference. It is really easy to make. If you find it sticky, add more of lemon! 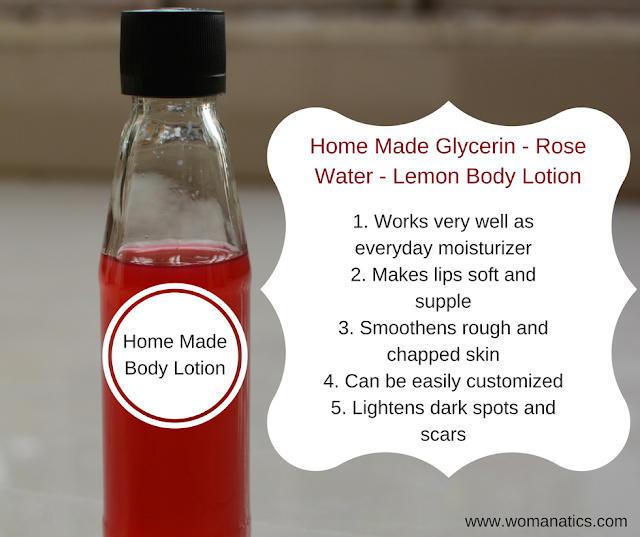 If you think it doesn’t moisturize your skin well, add more of glycerin! If you want to balance the both and want a lotion that gets absorbed quickly, add more of rose water! Add 1 tsp of an essential oil of your choice. I prefer rose oil for its lovely fragrance. Add 1 tsp of Vit. E oil to it. If you do not have Vit. E oil, simply squeeze two Vit. E capsules into it. Mix and shake all the ingredients in the jar or bottle. Store and use. It goes well upto 3-4 months without rotting. Glycerin – the humectant qualities of glycerin help in locking moisture of the skin. It smoothens the skin by providing it with excellent moisturizing. Lemon Juice – since it is high in vitamin C and is loaded with antioxidants and fruit acids, it helps in skin lightening and in flushing out the toxins of the skin. Lemon juice is the best cleanser. 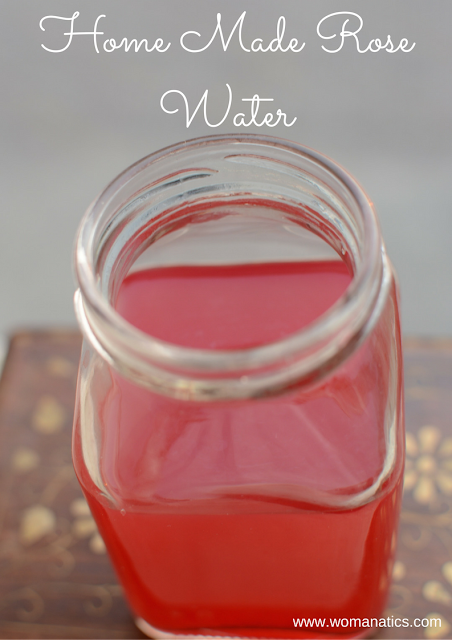 Rose Water – has anti-inflammatory properties and that helps in over all toning of the skin. 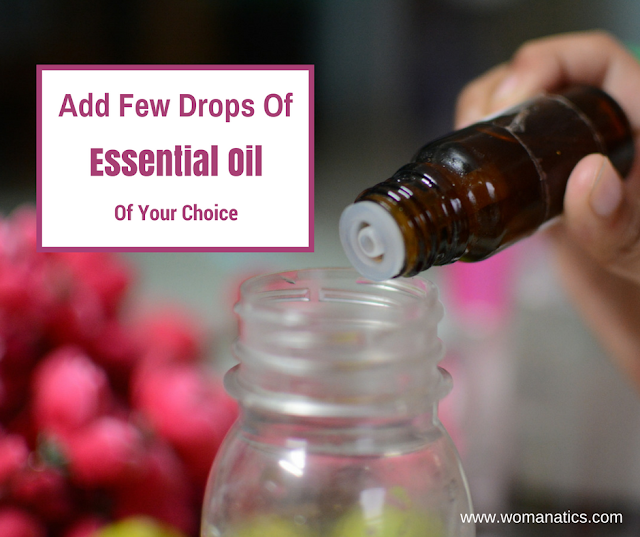 Essential Oils – help in giving a mild fragrance and the added benefits of their nature. Vitamin E Oil – helps in moisturizing and improving skin’s elasticity as well as acts as a preservative. Up the dose of lemon juice and rose water. Add peppermint oil or lemon oil (optional) and you have a face moisturizer that won’t break out. Up the amount of glycerin in comparison to lemon juice and rose water. Add jojoba oil or rose oil (optional) and your skin won’t feel dry again. Combine all the three ingredients in equal measure and your perfect lotion is ready. Note: Avoid using it on irritated or broken skin as the lemon juice may sting. My body lotion looks red because I added red-colored HOME MADE ROSE WATER to it.